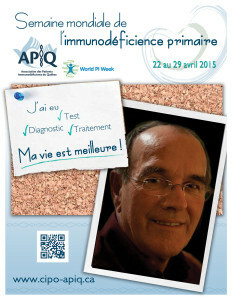 For the 2015 edition of the World Primary Immunodeficiencies Week, APIQ asked the members of our association to commemorate the occasion in many ways. They had the perfect opportunity to create their customized poster to raise general awareness on social media with the My life is better! campaign. In the last two years, this campaign gave the opportunity to several patients to show themselves as patients with a primary immunodeficiency but also show another side of this condition. In preparation for this year’s campaign we invited patients to ask questions to the doctors. Those questions were answered during the conference organised on April 25, 2015. Some moving patient testimonies were shared and the knowledge of Ms Marie-Claude Levasseur, Dr Elie Haddad and Dr. Hugo Chapdelaine contributed to make the day a real success! 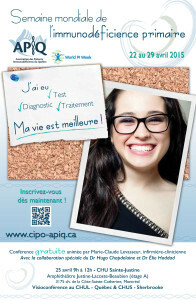 To close World Primary Immunodeficiencies Week, APIQ launched, with the financial support of IPOPI and CSL Behring, a $5000 grant to allow the patients and the hospital staff to plan an activity together. The winner(s) will be announced on July 15, 2015. For further information, you can visit our website.